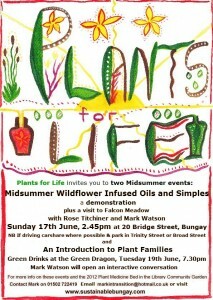 Everyone is welcome to our 6th Plants for Life 2012 event, an (almost) midsummer visit to Outney Common this Sunday 17 June, and a demonstration of how to make wildflower and plant oils by Rose Titchiner, with an introduction to plant ‘simples’. If you are coming by car, please carshare if you can and note that there is no parking in Bridge Street. Close by are Trinity Street and Broad Street which have plenty of parking spaces. Walk down Bridge Street and over the bridge. There is a sign for Ditchingham and Norwich on the left. No. 20 is directly opposite this sign, the first house on the left down a gravel driveway (the pale yellow Victorian lodge cottage).